Matilda Baumgartner Novak was born in Hungary in 1935. She and her husband Joseph tried to escape Hungary during the revolution, but got caught. They spent a year in a holding camp before joining the rest of Matilda’s family in Los Angeles in 1957. Their house was always filled with lots of food, family and terrific smells from the kitchen. Matilda (“Mama”) was a phenomenal cook who entertained a lot. She had no choice — her husband (“Papa”) would frequently bring home unexpected guests, so Matilda was always whipping up something delicious. Their house was where all the neighborhood kids came, especially for Mama’s homemade seven layer cakes. Everyone always told Mama she should open up a restaurant, so when Papa got laid off from his job, they decided to do it. 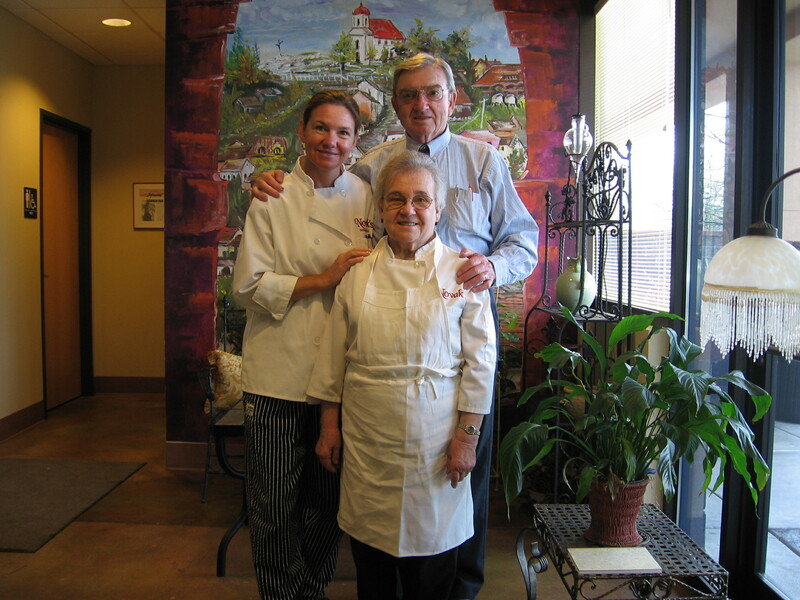 With the help of their twin daughters, Karen and Matilda, the original “Novak’s Hungarian Paprikas” opened in Albany, Oregon, in April 1984. As Mama and Papa are quick to point out, sons Eddie and Joey have also contributed to their success, along with various nieces, nephews and grandchildren. Over the years they’ve been blessed with a loyal following and have garnered the recognition of such food-related publications as “Northwest Best Places” and “Bon Appetit.” While Chicken Paprikas remains their signature dish, they serve many other delicious Hungarian and continental dishes as well as tasty pastries.Today they’re known simply as Novak’s Hungarian Restaurant . These days you’ll find Karen (who, according to Matilda, inherited all Mama’s talent) running the show, but Mama and Papa (for whom “retirement” is not in the vocabulary) are still very much a part of the day-to-day operation of the establishment. Papa’s the personality in the front, and Mama continues to work in the back, baking three different kinds of bread and many other pastries daily. Their food is definitely worth the trip to Albany; in the meantime, you can sample some of their specialties this month right here at Mother’s Bistro & Bar.